Did you watch the premiere? As much as I want to talk about it… I won’t. You know… “Spoilers Sweety!” (Oh, I miss River Song!) I absolutely loved Peter Capaldi as The Doctor too! I am really excited about the new series. I celebrated the premiere with some amazing Souffle’s for dessert & I was wearing one of my many Doctor Who t-shirts! How did you spend it? Did you make Fish Fingers and Custard? As promised Part 2 of the Doctor Who series brings you the recipe to make mini Cheesecakes that look like Fezzes! I love the way Matt Smith says “[insert clothing item name] are cool!”. He very valiantly pulled off wearing Stetsons, Fezzes and popularized bow ties. 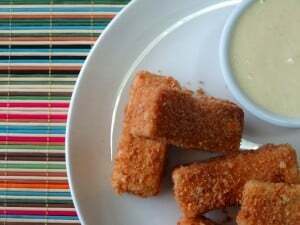 Did you save the recipe for the “Fish Fingers” and Custard? If you didn’t… go check it out now. Vanilla Basil Cake Batons & Lime glaze with Creamy Custard was amazing! 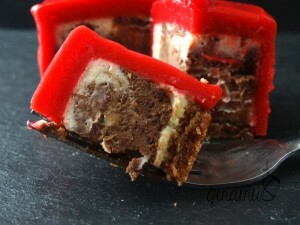 This is part 2 of the Dr Who party with Mini Edible Fezzes which are really Mini Cheesecakes with Raspberry Gelee. For the crust of the cheesecake, you can use any biscuit that you can crumble up. When I lived in New Zealand/Australia I always used Chocolate thins for the crust. Here in the US, I use Graham Crackers instead. To create the crust, you have to crush the biscuits and mix it with melted butter to create a “dough” that just holds together when you squeeze it. The amount of melted butter you need can vary depending on the biscuit you are using. So have some extra melted butter just in case. To make a layered cheesecake like I did, mix half the batter with a chocolate ganache. 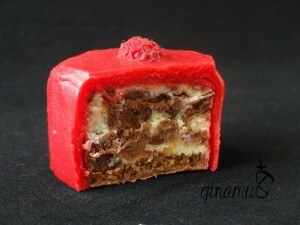 I like using bittersweet chocolate for the slight bitterness of the cocoa, but you can use semi sweet or milk chocolate – but just be aware that the intensity of the chocolate will be less. You can create a swirl pattern (if you like) with a toothpick. However, this is optional. When you’re baking the cheesecake keep a close eye on it to make sure it doesn’t overbake. The middle should still be soft and just set (with no cracks), and the cheesecakes will continue to cook after you take it out of the oven. 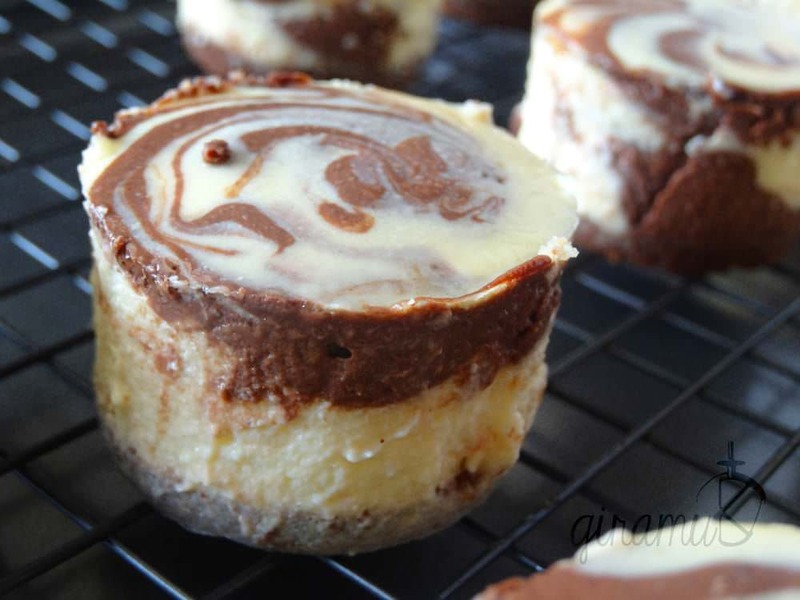 Since these are mini cheesecakes they do bake much faster. The Raspberry gelee was a little harder to create. I needed to find a way to make it stick to the cheesecake and also seem seamless. 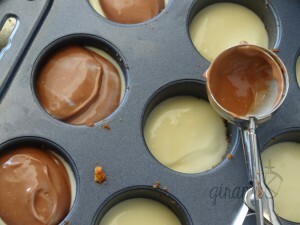 I decided against the pouring method that I used for the Chocolate Mousse Panacotta bites, because I wanted it to be a smoother and a thicker layer. 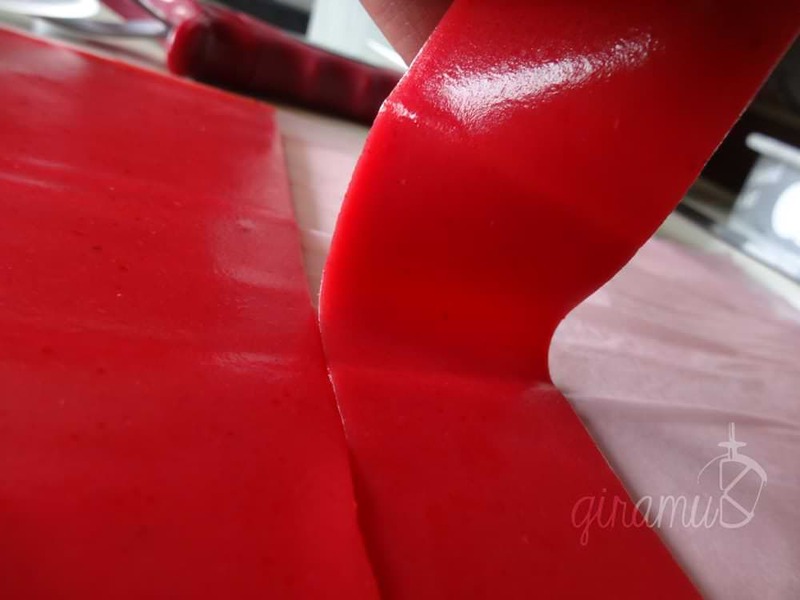 I used most of the mix to create a raspberry gelee sheet in my rimmed baking sheet and cut out strips to the height of the cheesecakes and circles to fit the top. This was prepared while the cheesecakes were chilling in the fridge. I thought of using chocolate to help adhere the raspberry gelee but decided to keep it all raspberry. 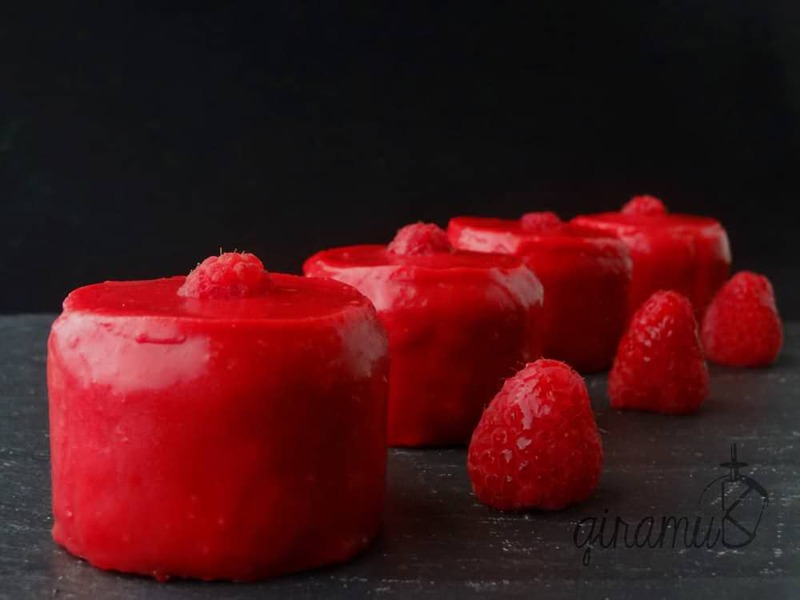 I used the left over raspberry gelee liquid to pour over the chilled cheesecake and immediately wrapped the raspberry sheet around the cheesecake. 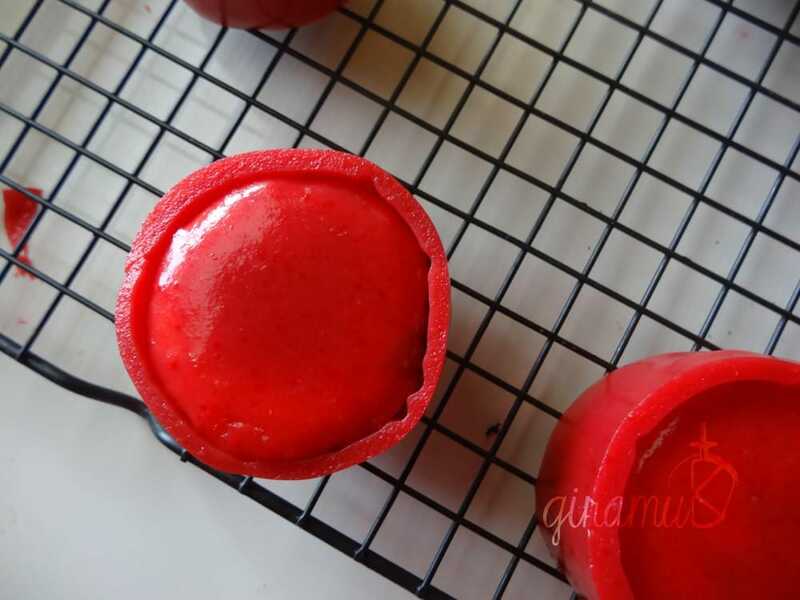 I placed the gelee circle on top and then used a hot spatula to seal the edges. 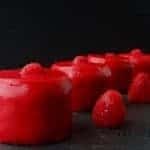 For some I poured a little more raspberry gelee on top to smoothen out the gaps. To complete the Fez look I cut off the tips of the raspberry and placed them on top to look like the button on the Fez. They looked too cute!! Plus they tasted amazing! I loved the contrasting creamy, sweet, bitterness of the cheesecake and the sourness of the raspberry. Even if you make a large cheesecake with a raspberry gelee topping you will love it! 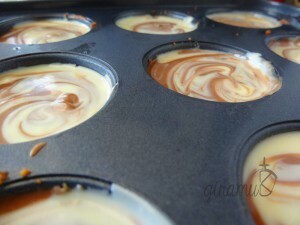 Melt the chocolate and cream together in the microwave (Only heat until just melted). It should be a thick glossy ganache. Leave aside to cool. 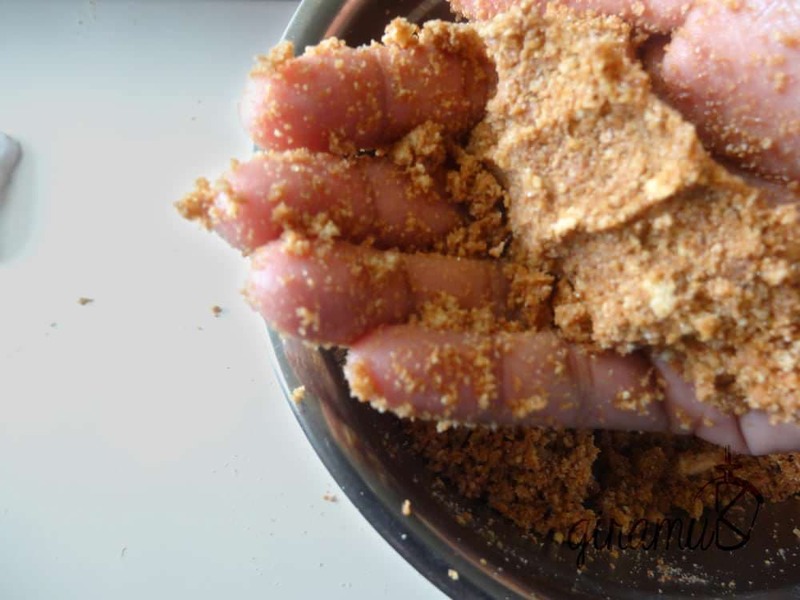 In a bowl or food processor, combine the crushed biscuits and melted butter until it is wet enough to hold together when squeezed in your palm. Bake the crusts in the oven for about 10 minutes. In a mixer bowl, combine the softened cream cheese, cream, sugar, and lime. Mix all these ingredients until it is nice and smooth and creamy. Add the eggs one at a time, and incorporate them into the batter well between each addition. 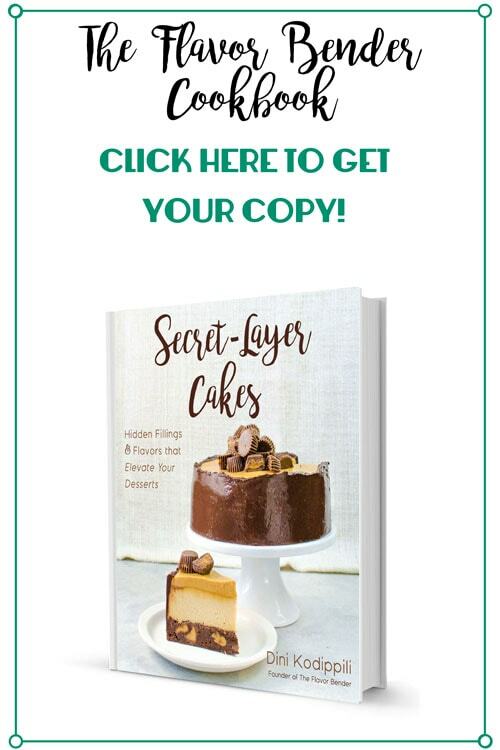 With a cookie scoop or spoon, fill half of the cavity with the regular cheesecake batter, and the other half with chocolate batter. Bake in a preheated oven until the top is just set, and the top is starting to puff up (But not crack). The time varies according to the size of your cupcake tray. Mine took about 20-30 minutes. Remove from oven, and leave to cool for 10 minutes. Gently turn out the cheesecakes onto a parchment paper (be very gentle), and turn them back right side up. (If you have a loose bottom pan, you can gently lift them out of the pan). 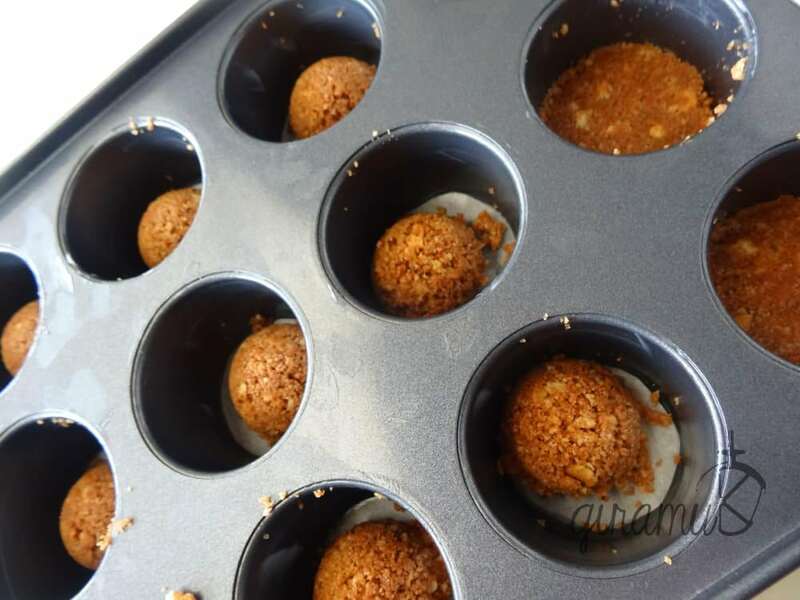 Leave them to cool until room temperature, and then transfer them to a fridge to chill. While the cheesecake is chilling in the fridge, place the 1/4 cup of water in a bowl and sprinkle gelatin powder to let them bloom for about 10 minutes. In a small pan - heat half the raspberry puree and when it is warm add the gelatin and stir to dissolve completely. Add the rest of the raspberry puree. To sweeten the Raspberry gelee, drizzle the sugar syrup while stirring. The amount of sugar to add depends on your sweetness level. I added about 3/4 of a cup. You can add a drop of red colouring if you would like to get a deeper red colour. 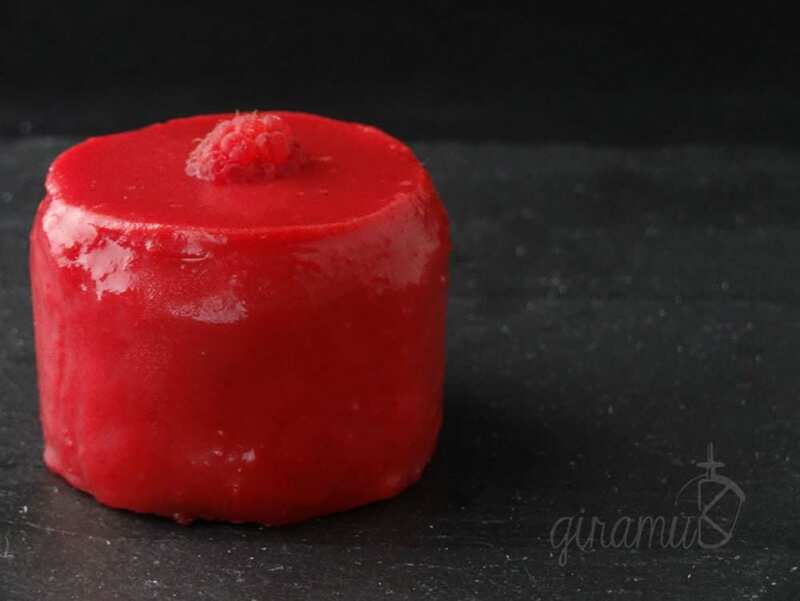 In a 9x 11 baking sheet pour the raspberry gelee (about 2-3mm thick) and leave it to set in the fridge. Set the rest of the gelee liquid aside. Once the gelee has set, place the cheesecakes on the baking rack on top of a clean baking rack. Pour the gelee liquid over one cheesecake and wrap the gelee strip around it. Place the gelee circle on top. With a small spatula heated with hot water, place them gently at the seams to seal the edges of the strip and the top of the gelee circle. To help with smoothening out, you can use some gelee liquid as well. Repeat with the rest of the cheesecakes. 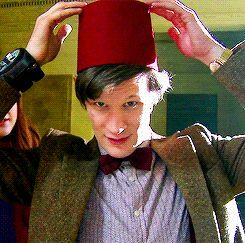 Fezzes are cool… & tasty! The Dr Who catch up party was great! The night was spent eating “Fish fingers” and Custard plus Cheesecake Fezzes, and I was wearing one of my many Dr Who t-shirts… and annoyingly trying to explain what’s going on to Mr K, who started watching the show only very recently. On the Premier night it was no different! He still doesn’t know who Clara is, he has a while to go to see why she is called the Souffle girl! 🙂 but he still enjoyed the chocolate souffles I made! Here’s another Whovian who did some amazing Doctor Who themed goodies – You can check out Vohn’s Doctor Who themed foods here. I wish I knew more Whovians living nearby to share this enthusiasm with… but for now I’m sharing it with you! Did you have a viewing party? What were you doing on Saturday? Let me know in the comments below. I thoroughly enjoyed the After Who Show too, and I can’t wait to find out more about some of the characters. Here are some more Doctor Who goodies for you to check out! I’m still cooking up stuff in the kitchen and I’m always updating on facebook, twitter and instagram – so follow me to find out what’s happening next. Plus you can send me a message to let me know what you would like to see more on the blog too! 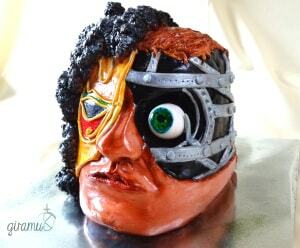 26/10/2014 Edit : If you liked this Doctor Who themed dessert, be sure to check out my Half Face Man – Clockwork Droid hybrid Sculpted Cake in the post here I did for Halloween/Time Lord Chefs Baking Event! 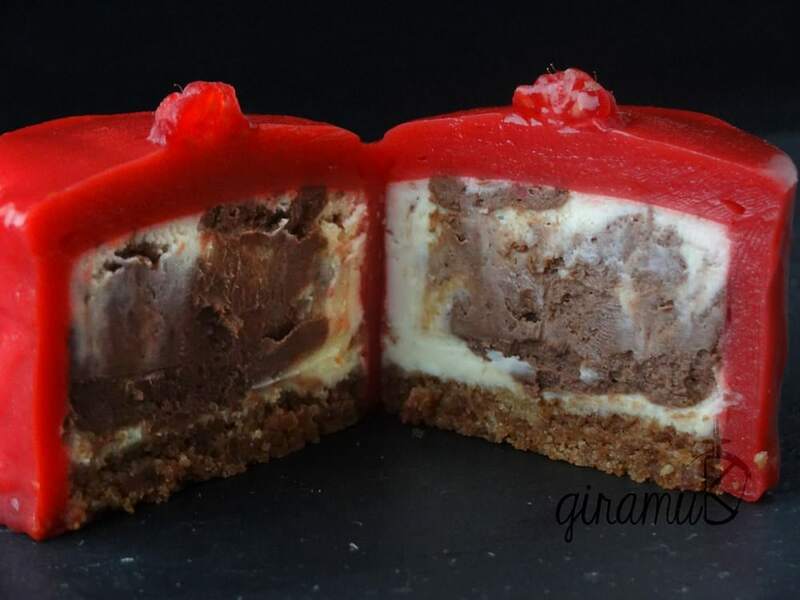 These mini cheesecakes look delicious.. and they look even better with that raspberry gelee. I definitely need to try my hand at the recipe, hopefully my cheesecakes turn out as good looking as yours. Thank you Thalia! They were so much fun to make. I’m sure they will turn out great 🙂 You make awesome goodies too! LOVE LOVE LOVE these sweetie! 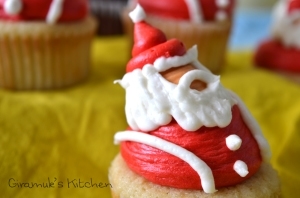 They are so cute and so expertly made. Well done for coming up with a new delicious Doctor Who bake. Fantastic! Thank you Vohn! 🙂 I loved all your goodies especially the Dalek Cake! It is always fun to make Doctor Who stuff right? Fantastic! River Song happens to be my all-time favorite character from Doctor Who. I got to watch the show the day after on Amazon (I don’t have BBC America). I like the new doctor a lot, and I like how Jenna-Louise Coleman gets to do a little more acting than just “being cute” as has been the case in many episodes. And who is Missy? My husband and I think that she’s too creepy to be River. Could be The Rani, or perhaps The Master as a woman (Missy = Mistress)? 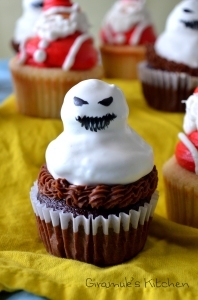 These are too divine to eat!